The T-Mobile G1 was released on 22nd October in some countries and 30th October for the rest. This new smartphone manufactured by HTC is unique to its competitors because it is the first device running Android. 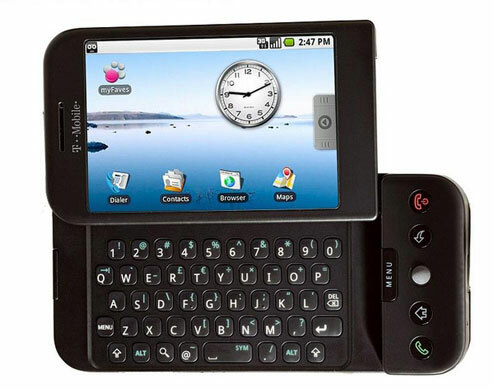 Android is a software platform and operating system developed by Google and can be used on a number of mobile devices. Android is free to use and is open source so anyone can download the source code and begin modding the software however they like. This open source approach will see thousands of custom mods developed for the device as developers begin reskinning and adding their own applications. There will be a lot more freedom to do things which are impossible with Apple products, such as the iPod or iPhone. Users will also be able to download applications from the Android Marketplace, similar to the Apple Store on the iPhone. As part of the Android Open Source Project, you can now download the entire source code from here. However, you should take note that you will NOT be able to build Android source files if you are not running Linux or Mac OS. Has the original price of the iPhone caused people to reconsider buying this product? Has it’s sales not met the quota that Apple wanted to achieve when they released the original iPhone? We may never know. What we do know is; Apple has just unveiled a new version that is claimed to be faster, cheaper and have a slightly different design to the original. The new iPhone will run on the 3G network. This means services will be more advanced than before and offer more features. Some of the services include; video calls, long distance telephone connectivity and high speed wireless broadband which will offer an incredible 14.4Mbit/s in download speeds. It also comes with a 2MP camera like the original iPhone, this is not up to par with recent cameras on the market but can still take a decent photo. The rechargeable battery included with the phone allows an impressive 5 hours of internet use on 3G and 6 hours on Wi-Fi. Video playback is up to 7 hours and audio playback reaches over 24 hours. The iPhone launches next month (July 11, 2008) in 20 countries, and eventually expects to reach over 70 countries worldwide. The price for the new 3G iPhone is set in the US at $199 for the 8GB version and $299 for the 16GB version. The 3G iPhone will be the same wordwide and will use the same network. This has been confirmed by Steve Jobs when he mentioned the 3G iPhone will be tri-band. People will be able to buy it from the US and bring it back to their country. The only downside to this is power input is different in different countries and there may be language issues. The dilemma still rings in the minds of all; buy an iPhone or an iPod Touch? With touch screen technology reining the world, here are some easy and quick references that will help you to decide which one to buy. The iPod Touch costs $100 US less than an iPhone. So if you are tight with your budget then the iPod Touch is probably the better option. It has double the memory of the iPhone for the same price. Again, the iPhone is physically bigger and heavier than the Touch. Although it doesn’t make much of a difference, the relatively smaller size of the Touch feels great once you hold it in your palm. On the contrary with the Touch, you simply cannot snap a photo, as it does not have a built-in camera as the iPhone can. The iPhone is designed in such a way that it can be used with a monthly service fee. The Touch however, comes contract-free. Hacking is possible in both the iPhone and iPod Touch. It is only through Wi Fi that you can surf the internet on the iPod Touch but an iPhone uses EDGE to supplement the internet availability. Therefore, if you are away from any Wi Fi hotspots you can still access the internet. Again, there are no application that has maps on the iPod Touch, aswell as the power to view stocks, weather widgets or have Bluetooth capabilities. If the iPod Touch is in sleeping mode, the user can tap the home button twice and that by itself will bring up touch controls on the screen. 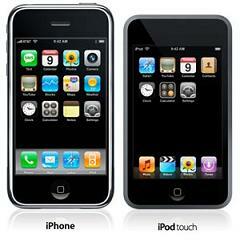 The iPod Touch has separate Video and Music applications, whereas the iPhone has both built in to one like the iPod. The touch screen of the iPod appears to be of a higher quality than iPhone but it doesn’t have a built-in external speaker. Thus, in recent days, the war is on! We will be sure to see a creation of more diverse options when it comes to phones and multimedia devices on the market. Society will have greater challenges to face, including what devices to buy, as the market becomes more competitive.